In 2007, mechanical engineer Eben Bayer and a friend invented a new kind of packaging material. 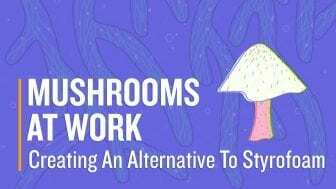 What makes the stuff unusual is that it’s fully recyclable: It’s made from organic material like wood chips or cornhusks, held together by mycelium, the threadlike structures made by a fungus, such as a mushroom. As a child on a New York farm, Eben Bayer helped his dad shovel wood chips in the barn. That’s where he noticed a stretchy web of fungus that became the basis of his biodegradable packing material. Bayer’s idea has caught the imagination of a lot of other people. Now the CEO of a company he co-founded, Evocative Design, he was called a tech pioneer by the World Economic Forum several years ago, was on Forbes magazine’s 30 under 30 list in 2015 and has been recognized for his work’s environmental quality by the Environmental Protection Agency. Large companies like Dell and Ikea have used his packaging to ship their products. This video is from the Joe’s Big Idea series Changing The World, One Invention At A Time. Check out the entire series here.